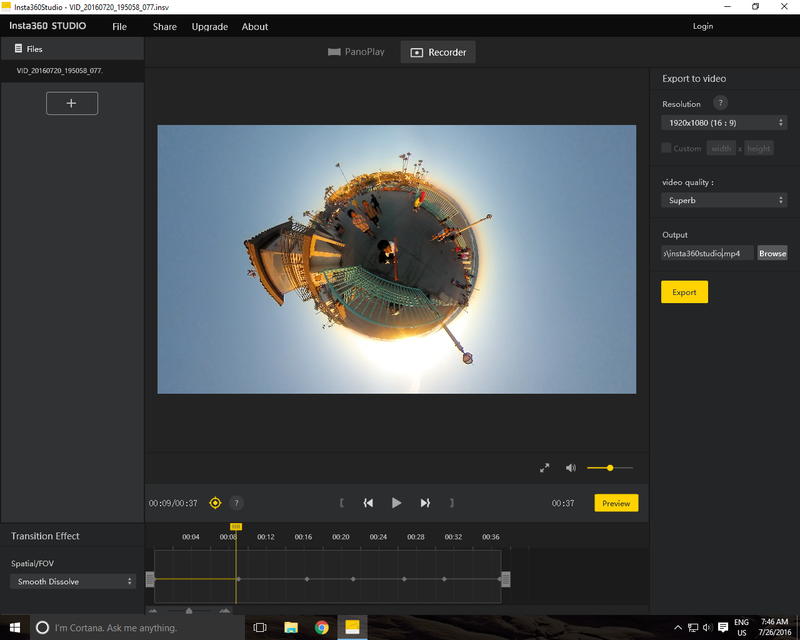 Insta360 Studio is a free software that enables you to view 360 photos and videos, and edit 360 videos. It’s available for both Windows and Mac OS X. The software is from Insta360, makers of the Insta360 4k and the Nano cameras. 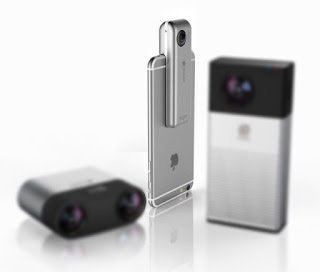 However, it can also be used for photos and videos taken by other 360 cameras as long as they’re in standard equirectangular .jpg or .mp4 format. In addition to jpg and mp4, Studio can also read Insta360’s proprietary .INSP 360 photo and .INSV 360 video format. When viewing photos or videos, you can switch from a regular 360 view, or a little planet view. In either view, you can use the mouse to drag the view to a different perspective. You can also use Studio to edit videos (but not photos), transforming them into different perspectives. In this sense, it has a similar function to mobile apps such as Rollworld, which are not yet available for Android. However, Studio offers multiple transformations and more sophisticated transformation controls. Insta360 Studio is available for download here. Thank you for the info! Just got my Insta360 and was at a loss on how to get the pictures edited. Thanks Loura. Congrats on getting the Insta360 and I'm glad you found the info helpful. If you have any other questions about Insta360, please let me know! Hi Juan. I think it is a false positive, not a Trojan. Hi Sin Ting Lee! That's something the current version of Insta360 Studio can't do yet. But you may be interested in Collect video editor or V360 editor. Both are Android apps that can create montages. cool… but my insta360studio is not working i have to convert the video into mp4 first then i can open it in insta360studio however, the video is not in pano, the pano and recorder buttons are disabled… something wrong iguess…Do u have an idea? Hi Encep. Sorry for the very delayed response. I just saw your comment now. Anyway, I tried it just now with a Keymission 360 file and it works. It's likely that your video is not in a 2:1 ratio which is why Insta360 Studio grayed out the recorder. Hi! Is it possible to import files from my Samsung Gear 360 camera, directly into insta360studio? Sorry, no you have to stitch the video first on the Samsung Gear 360 phone app or on ActionDirector. How i can add muliple videos to the timeline? Or is there no way? Thanks for providing insta360 for free! You are planing to add this feature. realy i would pay for it. File corrupted or does not exist. Remove the file from the file list? I have the same problem with a 360 video in mp4 format. Sorry to say this, but there is something fishy about this program..
Hi Juan. A lot of people have used this program, not just me, and we didn’t have that problem. So I think the program works. But if you don’t want to use it, you can try rollworld for iOS. Hi Jonatans. Sorry for the delayed reply. I have not seen that message before. Maybe the file was moved from its original location? How about trying to drag and drop the file into the program? Need to export the file 1st on to your desktop before using the program. I have the same problem when trying to open files directly from the phone or camera. After playing with different ways, I found out this is the only way to avoid that particular error. Is there any way to export images from the samsung gear 360 with max resolution? first i stitch it in gear 360 director and then i imported to insta360, but i can´t export the image in very high quality. Only in print screen. Same with video. Hi Juan. On Insta360 Studio, try to click on the Recorder tab. You should be able to export in high resolution. Hi,do you now any other software that has an option to record as done by 360studio? Can the same kind projection and movement be done by a mobile app? Hi Partha. Check out Insta360 ONE and its FreeCapture feature. You can also try Rollworld (iOS) which can do a little of what Insta360 Studio can do. i can open a pano-jpg and convert it to a Little Planet, thats working perfect. But the only way to save the pic is to use the Screenshot-Button under the picture. The right side (Export to Photo) is complete grey, no changes possible. Any idea? The Studio software can only deal with pictures/videos for 4K or lower, if your picture is 5K the button is greyed out. I’ve tried everything I can think of, and can’t find a solution to this problem. What are your computer’s specs? I’m wondering if there is a minimum spec. 3.40 gigahertz Intel Core i7, 32 gb ram. I can’t imagine that my computer is not up to the task. I don’t understand why my export settings are different than the ones shown in your screenshot. Wow, what a surprise…it is suddenly working (exporting video). I don’t know what I did differently, but I’m happy I can use this software now. I’ll try to record my workflow the next time I make a video using Insta360 Studio and report the results. I haven’t used it a while…. I’m trying to use FreeCapture on 120fps footage, but I keep receiving an error message: “Does not support preview of 120fps. Please export to view.” How can I fix this to preserve the .insv file and still be able to use FreeCapture on my slo-mo footage? Hi TJ. Is the 120fps bullet time video? If yes, then you can’t free capture it. It has a fixed hemispherical view. Question, I have done multiple property 360 vids, when i export I only want the view of the room/property not me, but each time i export i always get the view facing me rather than the outward view. how can i change this pls? Hi Mo. Not sure if i understand, but you can use crystal ball view or some other view and drag the screen to change the view so you’re not in it. Then you press the camera icon to export that view. What are your computer’s specs? I’m wondering if there is a minimum space. I dont know how much space i have. How much space do you have?